Sharp Azteca at Three Chimneys 10.19.18. 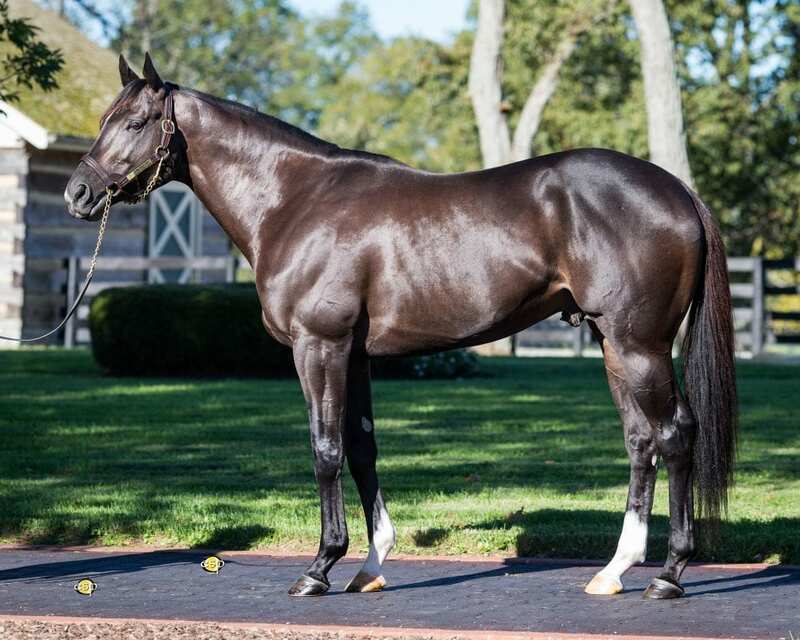 Three Chimneys announced on Saturday that 2017 Cigar Mile (G1) winner Sharp Azteca will take up stud duty at Three Chimneys Farm for a fee of $10,000 LFSN. The model of consistency as a racehorse, Sharp Azteca was on the board 14 times in 17 starts, with career earnings of $2,406,740. A five time Graded Stakes Winner, he won the 2017 Cigar Mile by a commanding 5 1/4 lengths over Grade 1 winners Practical Joke, Mind Your Biscuits, and Grade 2 winner/G1 performer Tom's Ready. In that race Sharp Azteca ran a negative 2 and ¼ Ragozin, the fastest Ragozin in 2017 at a mile and the co-fastest of the year at any distance, equaling the number awarded Arrogate in the Dubai World Cup (G1). One of the Leading Sprinter/Milers of his generation, Mike Watchmaker of the Daily Racing Form said, “ Sharp Azteca was consistently the most brilliant miler we've seen all year.” He posted a 115 Beyer Speed Figure in the Grade 1 win in the Cigar Mile. His performance in the Kelso (G2), also at a mile, was nothing short of spectacular. His four length victory over Grade 1 performers Divining Rod and Tom's Ready in 1:34 flat earned him a 112 Beyer. As a 3YO, Sharp Azteca impressively won the Pat Day Mile (G3) in 1:34 1/5th, where he defeated G1 winners Imperial Hint and Ralis, as well as multiple G1 placed American Freedom. Sharp Azteca's valiant runner up performance in the Breeders' Cup Dirt Mile (GI) to Battle of Midway, who ran a lifetime best minus 2 Ragozin, received a 132 Equibase Speed Figure which is the highest of any horse retiring to stud for 2019 and equal to that of HOY Gun Runner ($15,988,500), HOY California Chrome ($14,752,650), and 5 time Grade 1 winner Flintshire ($9,589,910). A nine time Graded Stakes performer, he also placed in the Grade 1 Malibu and the $1 Million Godolphin Mile (G2) at Meydan. In addition, he posted two of the top three Beyer Speed Figures up to a mile in 2017. Sharp Azteca is by Champion sire Freud, a full brother to Giant's Causeway, who also sired recent G1 winner Fourstar Crook. He is out of the Saint Liam mare So Sharp, who is a half-sister to the dam of Graded Stakes winner Firing Line. The female family traces to Three Chimneys foundational mare and Grade 1 winner Gorgeous, as well as to Overbrook farm foundational mare and Grade 1 winner Seaside Attraction. This entry was posted in Bloodstock, NL List and tagged breeders' cup dirt mile, cigar mile, Freud, giant's causeway, Goncalo Torrealba, gorgeous, Kelso, mike watchmaker, pat day mile, Saint Liam, seaside attraction, sharp azteca, stallion, Three Chimneys by Press Release. Bookmark the permalink.